A caring, multifaceted chronic pain treatment from our expert staff of pain doctors, nurses and counselors. 1. The chronic pain program begins with an extensive diagnostic evaluation of your current chronic pain problem and any co-occurring illnesses that may be impeding your recovery. It includes a review of cg-term use of high doses of opiate medication can make the pain worse instead of better. We waurrent pain treatments and past treatments and leads to a diagnosis and treatment plan for you. 2. We typically start with a careful, medically managed reduction in the opiates you are taking because very often lonnt to learn – and want you to learn – what you need. 3. Chronic pain often limits physical activities leading to weakness and poor physical conditioning. This can lead to a downhill spiral of ever worsening physical conditioning, more discouragement – and worsening pain. Our doctors a reconditioning plan for each patient. Pain management is important for ongoing pain control, especially if you suffer with long-term or chronic pain. After getting a pain assessment, your doctor can prescribe pain medicine, other pain treatments, or psychotherapy to help with pain relief. What Are the Treatments for Chronic Pain? Milder forms of pain may be relieved by over-the-counter medications such as Tylenol (acetaminophen) or nonsteroidal anti-inflammatory drugs (NSAIDs) such as aspirin, ibuprofen, and naproxen. Both acetaminophen and NSAIDs relieve pain caused by muscle aches and stiffness, and additionally NSAIDs reduce inflammation (swelling and irritation). Topical pain relievers are also available, such as creams, lotions, or sprays that are applied to the skin in order to relieve pain and inflammation from sore muscles and arthritis. If over-the-counter drugs do not provide relief, your doctor may prescribe stronger medications, such as muscle relaxants, anti-anxiety drugs (such as diazepam [Valium]), antidepressants (like duloxetine [Cymbalta] for musculoskeletal pain), prescription NSAIDs such as celecoxib (Celebrex), or a short course of stronger painkillers (such as codeine, fentanyl [Duragesic, Actiq]0, oxycodone and acetominophen (Percocet, Roxicet, Tylox) or hydrocodone and acetominophen (Lorcet, Lortab, and Vicodin). A limited number of steroid injections at the site of a joint problem can reduce swelling and inflammation. In July 2015, the FDA asked that both prescription and over-the-counter NSAIDs strengthen their warning labels to indicate the potential risk of heart attacks and strokes. The risk increases with higher doses of the drugs. In addition, there is also the possibility of developing bleeding stomach ulcers. Patient-controlled analgesia (PCA) is another method of pain control. By pushing a button on a computerized pump, the patient is able to self-administer a premeasured dose of pain medicine. The pump is connected to a small tube that allows medicine to be injected intravenously (into a vein), subcutaneously (just under the skin), or into the spinal area. This is often used in the hospital to treat pain. Sometimes, a group of nerves that causes pain to a specific organ or body region can be blocked with local medication. The injection of this nerve-numbing substance is called a nerve block. Although many kinds of nerve blocks exist, this treatment cannot always be used. Often blocks are not possible, are too dangerous, or are not the best treatment for the problem. You doctor can advise you as to whether this treatment is appropriate for you. Did you know that osteoarthritis knee pain is caused by more than just cartilage loss? In knees with osteoarthritis, the joint fluid also loses its ability to absorb shock, which can result in osteoarthritis knee pain. 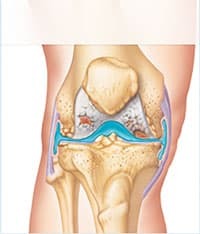 A viscosupplement injection is a treatment that supplements your natural joint fluid to give your knee the lubrication and cushioning it needs to provide osteoarthritis knee pain relief.